Collects issues 1-4 of Journey to Star Wars: the Force Awakens, Shattered Empire, Princess Leia 1 and Star wars issue 1 from 1977. This was a fun ride to the past. The main series, Shattered Empire starts near the end of Return of the Jedi with Luke battling Vader and Han’s team putting the explosives on that Imperial base on Endor, and a team of Rebel pilots attacking the Imperial fleet. Shara Bay is one of the pilots and she almost shoots at Luke when he comes down in that Imperial shuttle. After a battle where Shara lost quite a few friends, she’s looking for her husband who is on Han’s team. In the next two issues, Shara is Leia’s personal pilot when she goes to a mission on Naboo. However, the Emperor has left orders that Naboo will be destroyed after his death. Leia, Shara, and Naboo’s current queen must face down star destroyers! 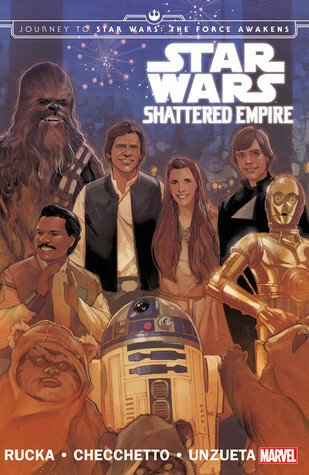 In the final Shattered Empire issue, Luke goes on a mission to recover something from an Imperial base. Shara is with him, disguised as an Imperial Commander. These were fun issues, letting us see Star Wars’ big heroes from the point-of-view of a minor character. However, Shara is a skilled pilot herself and used to danger, too. She and her husband Kes Dameron have a young son and they’re thinking of settling down. But Shara isn’t so sure; she feels like she’s abandoning the Rebels. Also, even though the Emperor is dead, the Empire still continues, fighting back as much as they can, and the rebels have a lot of clean-up to do. The Leia issue starts with the ending of New Hope. After the award ceremony, Leia gives a short speech about Alderaan’s destruction. She wants to get back to work instead of grieving but now there’s a huge bounty on her head, so she must stay at the base. She confronts a pilot who thinks that Leia is dishonoring her parents’ memory. The final issue in the collection is a reprint of Marvel’s first comic version of New Hope, with added Luke and Biggs scenes. 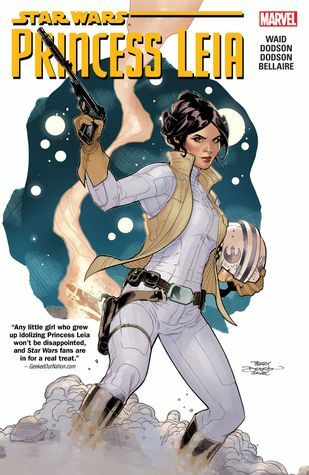 I really liked the Shattered Empire and Leia’s own adventure also starts nicely. The art was great in both stories. I hope our library has the Leia series, too. They’re not Earth shattering but nice short Star Wars adventures in the classic style. 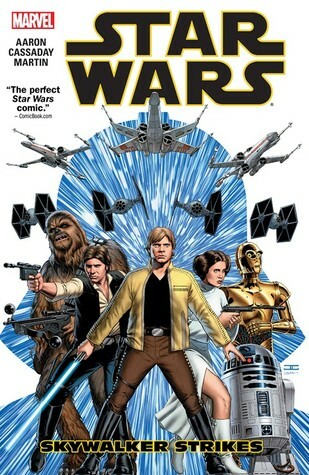 The new Marvel Star Wars comic, collects issues 1-6. This story is set between “A New Hope” and “Empire Strikes Back”, in fact shortly after episode IV. The Empire has started to make deals with criminals, like Jabba the Hutt, to get supplies, and the rebels have decided to stop them. So, Princess Leia’s small team infiltrates Empire’s industrial complex at Cymoon 1. Han poses as Jabba’s envoy to get them in and blow the whole place up. Unfortunately for them, the Emperor’s negotiator is really tough and things don’t go as planned. Later, Darth Vader deals with Jabba personally. Vader is looking for mercenaries to capture a particular rebel pilot. Meanwhile, Leia is trying to rally her troops for another mission. There’s even a Boba Fett subplot. This one feels like Star Wars. It was exciting and funny. I could hear the actors saying the dialog and there’s a lot of big-screen action and humor. However, Empire having to deal with criminals for parts feels ludicrous, but in a Star Wars way. There’s even some character development for our heroes. However, I’m not too sure about Luke confronting Vader before receiving any Jedi training. 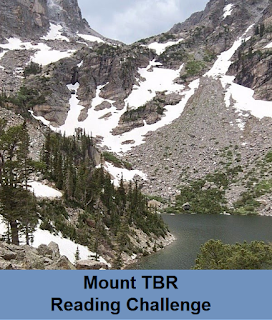 And there’s a cliffhanger ending. Otherwise, very enjoyable. This series gives us Mara Jade’s background. It’s mostly set during and right after Return of the Jedi. 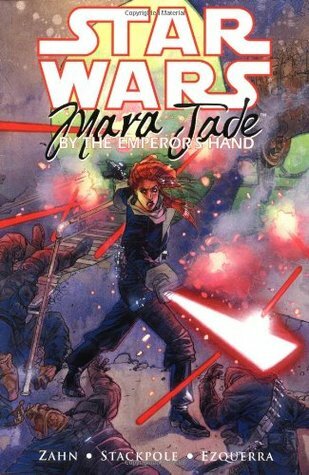 Mara Jade is one of the best characters in the Star Wars expanded universe novels and she was created by Zahn in the book Heir to the Empire. She was the Emperor’s Hand: an assassin and spy who did Emperor’s most secret jobs. She’s also able to use Force even though she isn’t a Jedi or a Sith. In this collected edition, we see her final mission for Emperor Palpatine shortly before he died at the hands of Vader and Luke. He also gave her a mission she will try to fulfill in Zahn’s books: to kill Luke Skywalker. Right at the start, we also see a glimpse of her trying to assassinate Luke at Jabba’s Palace. But in this story, she goes after the boss of criminal organization called Black Nebula and then survives as best she can the death of the Emperor. General Isard tries to take over the Empire and she doesn’t trust Mara at all. Mara is fanatically loyal to the Emperor because she genuinely believes that the galaxy is better off with laws. But she doesn’t discriminate against aliens, like we see many imperial officers doing. She’s also very insular: she doesn’t have a team and she doesn’t even talk with the crew when she has to travel by space ship. The only person she works with is a droid. The only person she trusts is the Emperor and she doesn’t expect backup from anyone. It’s a very lonely existence but she doesn’t seem to really mind; work was everything to her. And when she really needs it, she has the security clearance to force co-operation from imperial forces. Well, she has it at the start of the story, anyway. She’s more of a villain in this series but she does also protect people from criminals. 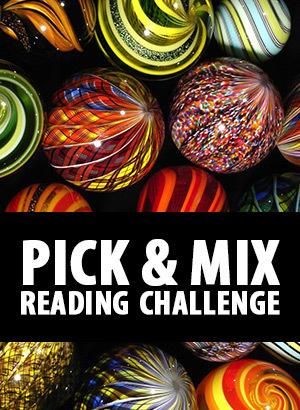 Recommended for people who like Mara Jade in the books. It’s not the best SW comic I’ve read but it’s decent. It’s not focused on battles because Mara is usually more subtle than that.